Gift Guide for the Travel Addict – Plan. Adventure. Live. Hanging, Travel Toiletry Bag. Compact storage, that is easy to access, on the go! Travel Jewelry Organizer. Jewelry can be difficult to travel with. It’s small and it tangles up easily. An organizer, like this one, makes it so much easier. Electronics and Cable Organizer. We live in a mostly digital world now. Most people find themselves traveling with multiple devices and each of those devices has its own cable. It can be a lot to keep up with. A case like this, will keep it all together. Personalized Leather Luggage Tag or Passport Cover. I ordered luggage tags for my husband and myself, on our third wedding anniversary. BrambleandBeene does amazing work! This would be a great gift! United States Map Picture Frame.Do you know someone that has traveled to several states or maybe it’s on their bucket list? This would be a cool way for them to display their travels! Personalized “Adventure Fund” Box. A fun way for your travel addict friends to save up for their next big adventure! Travel Journal for the Curious Minded. Justin bought me this before our last trip, and I loved it. It’s a unique way to document ordinary things on a trip abroad. It was almost like a scavenger hunt! A great thing to work on while we were on buses and trains. Travel Life Journal. This journal is blank inside, for those that like to freehand journal, about their travels. A simple, yet sweet gift for a travel addict. Travel Scrapbook Album and Accessories. For the travel addict, that also likes to scrapbook! This would be a great way for them to document their adventures. 50 States 5000 Ideas (book). For the friend or family that needs inspiration for their next trip! Top Dog Travel Bag. For the traveler that likes to bring their dog a long for the ride! Yahtzee: National Parks Travel Edition. Travel games are great for adults and kids, on long road trips. Hopefully, this gift guide has given you some inspiration for what you can get your travel-loving, friends an family. If you enjoy traveling, what are some gifts you like to receive? I imagine that smaller states, would be especially hard to fit a proper photo in! It would be a fun, conversation-starting piece, though. Thanks for stopping by! I hope Santa brings you that book. That book is on my list now, for sure! Thanks for stopping by! I am big fan of memory keeping and journaling, in general. I always prefer the paper and print version, to the digital kind. I think it’s a great way to pass down those memories, as well. I love looking through my grandparents photo albums, from their trips. Thanks for stopping by and commenting! Oh boy, so many great goodies! I love the cable organizer and the scrapbook, I’ll keep those in mind when I write my letter to Santa! Thanks so much for commenting! I hope that Santa brings you lots of good travel gifts! Cannot believe the holidays are here again! Great gift ideas – especially that picture map! Love that, and the personalized travel fund. Now if only Santa would fill it up for us, too! 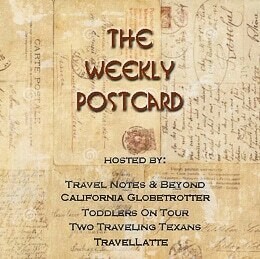 😉 Thanks for sharing with us on #TheWeeklyPostcard!